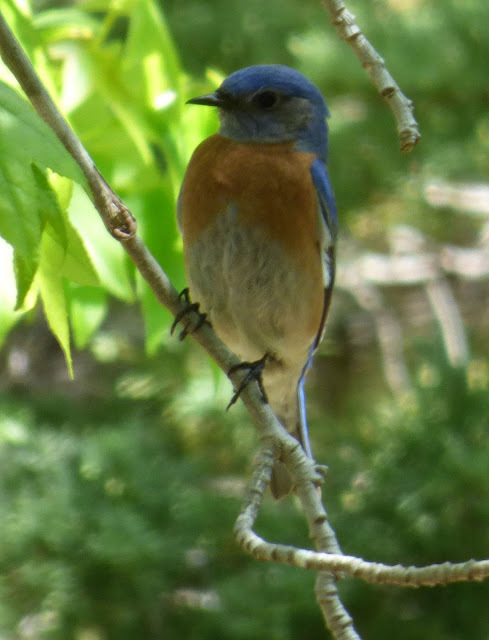 Bluebirds are a traditional sign of good fortune in several cultures, but the Bluebird of Happiness seems to originate in Belgian symbolist writer Maurice Maeterlinck's 1908 play The Blue Bird. 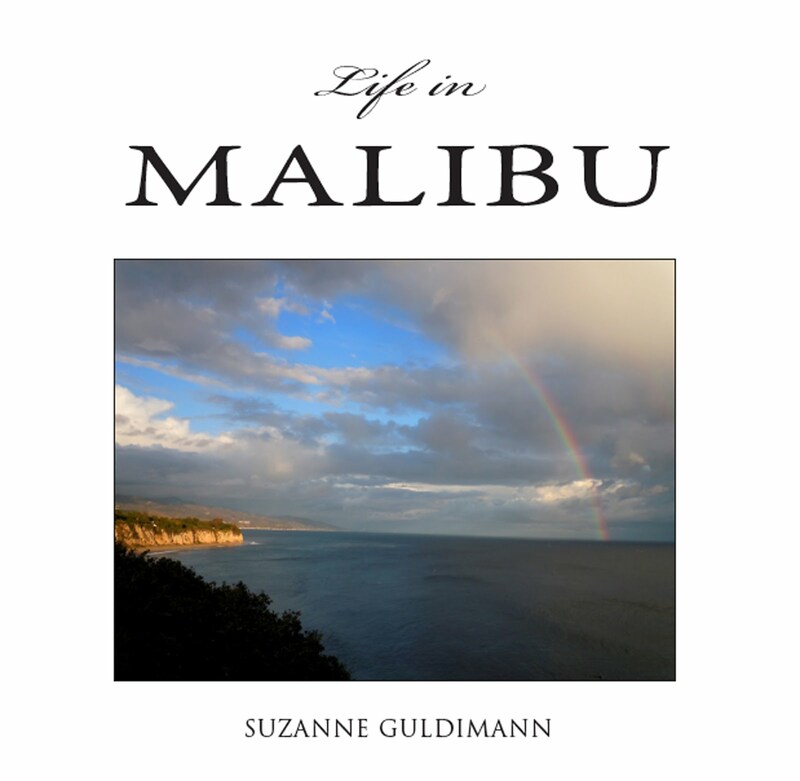 And like the children in the play, we found happiness—and bluebirds—right in our own backyard this spring here at The Malibu Post. 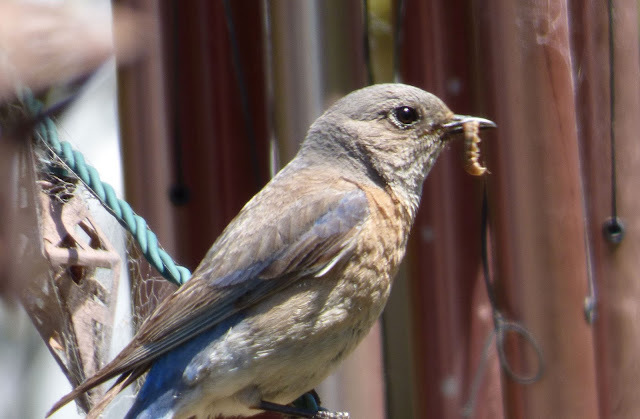 While its fate is still in the balance, the Western bluebird, Sialia Mexicana, appears to be on its way to a happy ending. This beautiful bird came close to extinction in the 20th century, due to DDT, habitat loss, and competition from non-native species like the house sparrow. 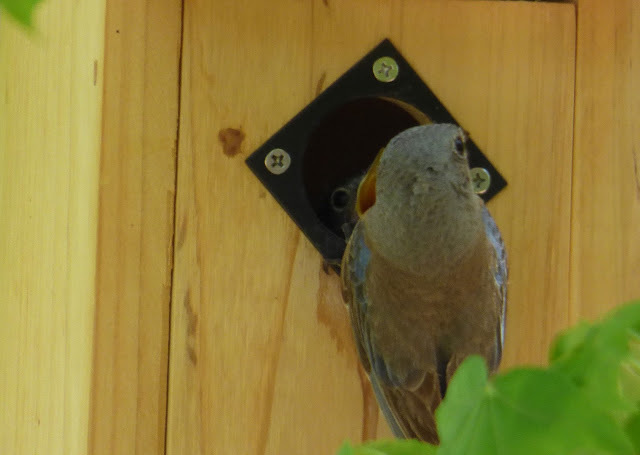 Bluebirds are making a recovery, thanks to passionate advocates who are providing a voice for the species and are seeking to reintroduce it to areas—like Malibu—where bluebirds have been missing for decades. 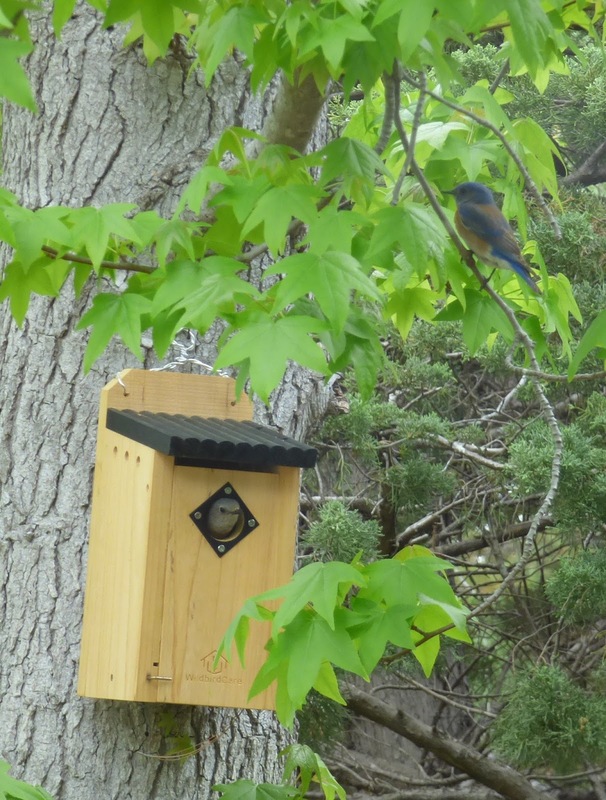 Encouraged by the presence of a bluebird family at our birdbath last year, we purchased a bluebird box this spring and installed it in a liquidamber tree. 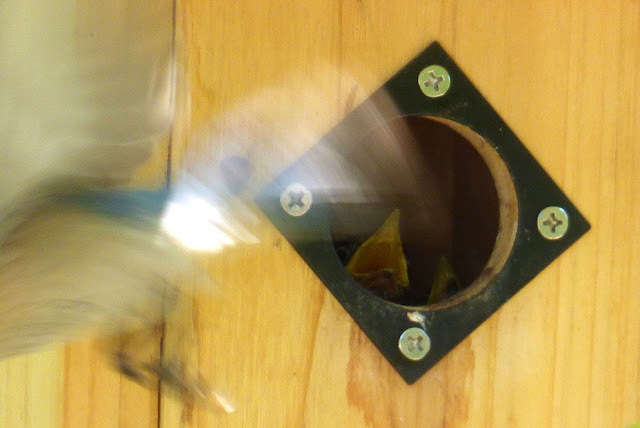 The first visitor to the box was an oak titmouse, but apparently the box didn't meet his requirements. A week later, a pair of bluebirds moved in. Nest building commenced at once. This is the male, bringing grass and what looked like palm tree fibers into the box. 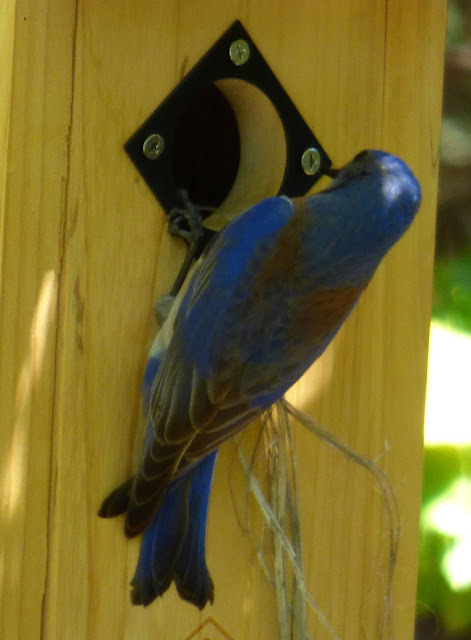 Both Eastern and Western bluebirds need cavities like hollow trees to successfully nest. 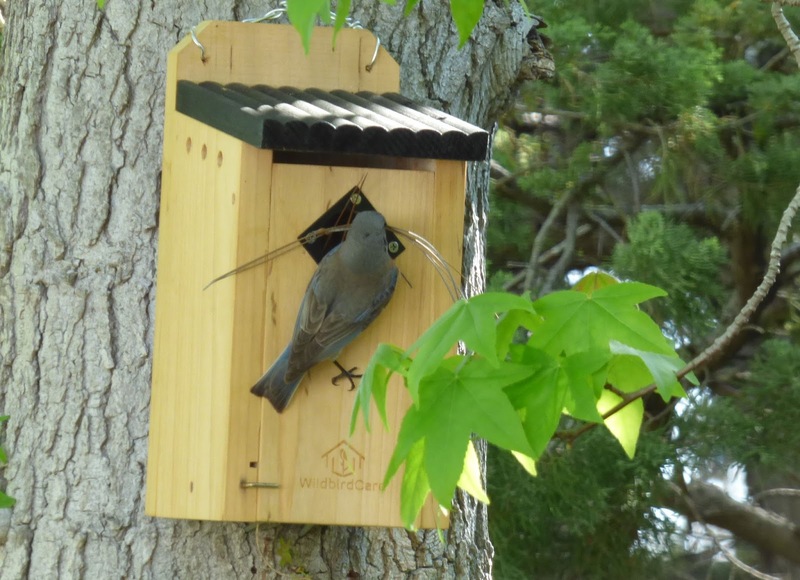 In the Santa Monica Mountains, they compete with wrens, tree swallows, and the oak titmouse, as well as non-native sparrows, for nesting space. The right kind of real estate can be scare. Nest boxes offer a good alternative, but they have to be the right kind of box. Wrens aren't particular—they'll nest in almost anything. But bluebirds need a tall narrow box for safety. It should have good ventilation and an entry hole that is the right size for the species. It's important to avoid the kind of bird boxes that have a built-in perch. 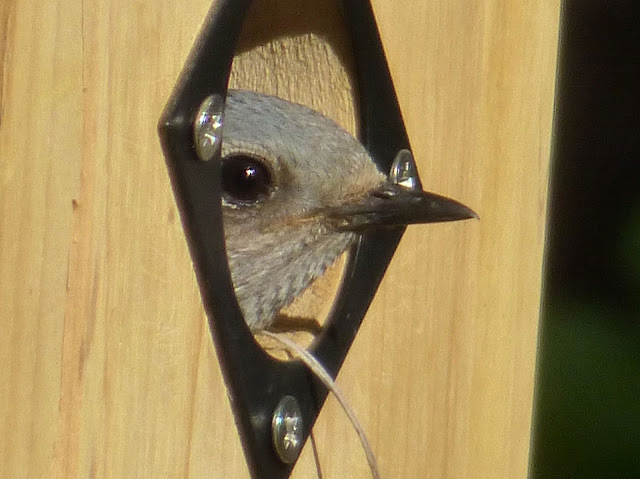 Predators like crows and squirrels can use a perch to gain access to the nestlings. It is important to place the bird house in a safe location where cats, raccoons and rats don't have access, and also to monitor the box to make sure house sparrows don't move in before the native birds have a chance. The industrious female kept showing up with astonishing amounts of building material. Here she is with a beak full of pine needles. Here she is again, carting in a bunch of oxalis stems and a dead leaf. Finally, the nest was finished and the business of laying eggs and incubating them begun. 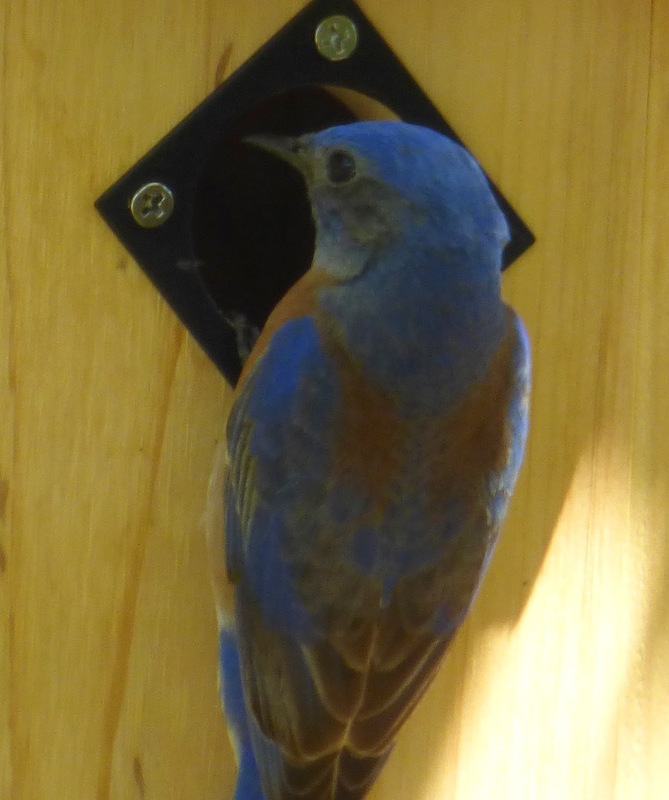 The bluebirds rapidly adapted to their human and canine neighbors. We often saw the female watching us from the entrance of the nest, but she never seemed to mind when we walked past. 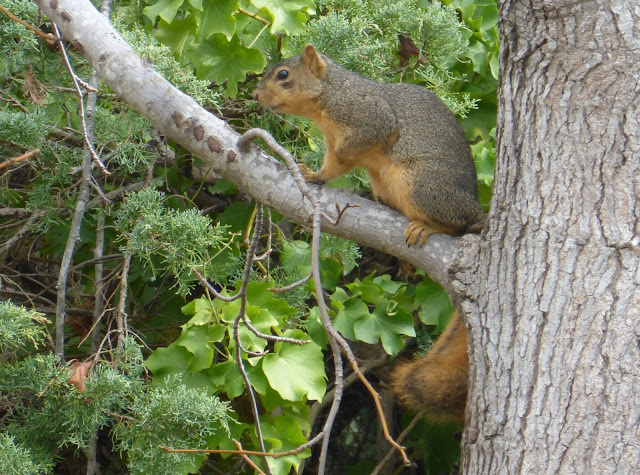 The male brought food to his mate and kept watch from the top of the tree for potential hazards. The neighborhood fox squirrel was the biggest threat. 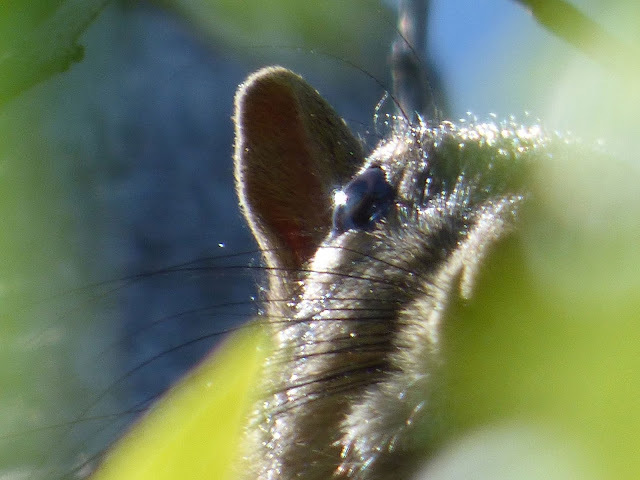 He lurked like a kind of rodent Godzilla, but never managed to break into the nest. Here's how he looked to the bluebirds. Not remotely cute and furry. 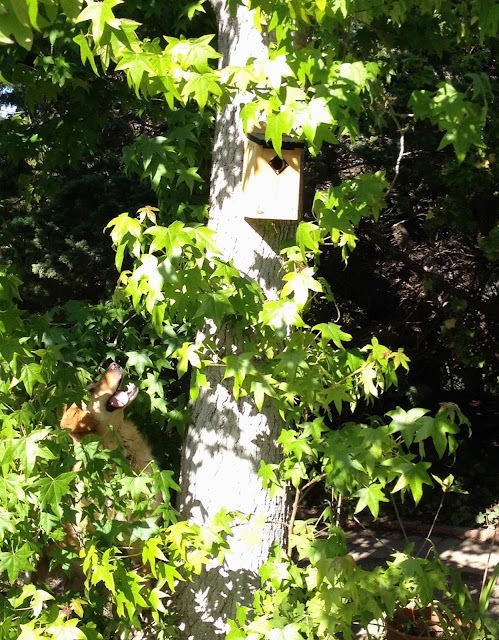 Our looney dog took no notice of the birds until the eggs hatched and the chicks grew big enough to make noise. Then she became obsessed and had to be temporarily vanquished from that part of the garden. Cats and dogs can have a catastrophic impact on wild birds and we didn't want to take any chances. Once the eggs hatched, the nest became a hive of activity, with both parents swooping in and out all day long with insects for their brood. Here's mama bird with a fine fat caterpillar. 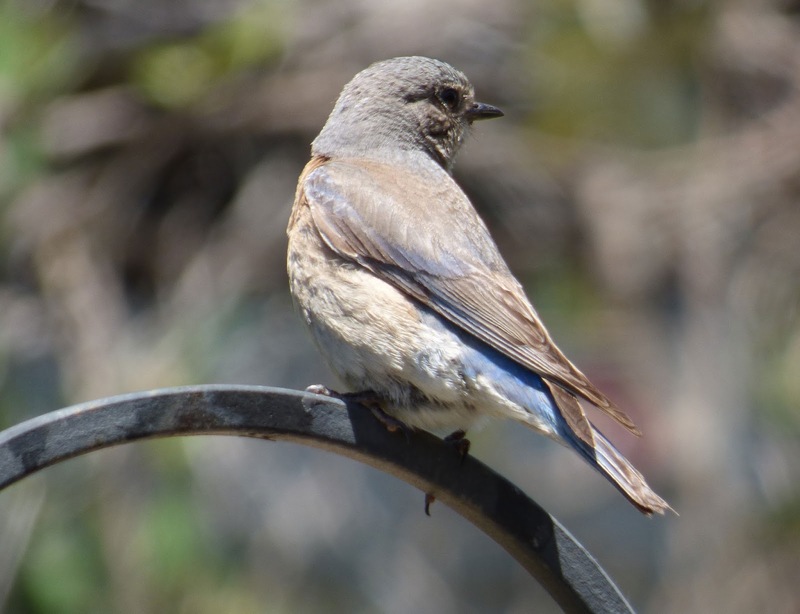 Bluebirds depend on open areas for foraging and often seek out lawns—a reminder of why it is important to avoid toxic pesticides and lawn chemicals. Ecologists warn that homeowners who replace their lawn with gravel or artificial grass in a well-intensioned effort to conserve water may actually be removing essential bird habitat, inadvertently creating wildlife wastelands. Replacing lawns with native plants, or adopting a turf-management program that conserves water through the use of mulch and other organic methods are bird-friendly options. That caterpillar went straight into the open beak of a hungry nestling. 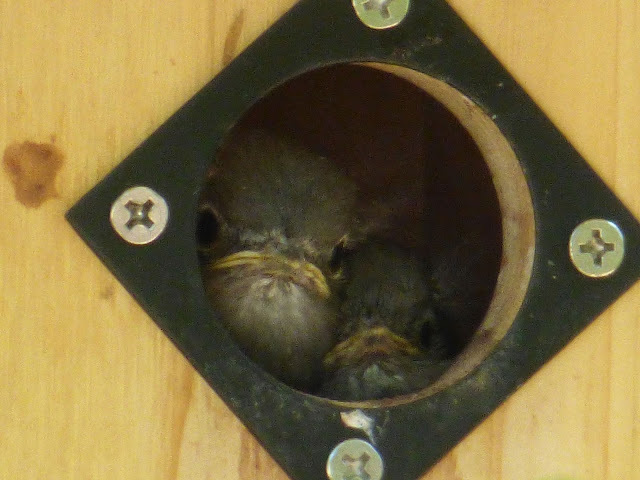 As the chicks neared fledging day they became increasingly noisy and active, peering out of their front door and chattering to each other. We never saw the young ones fledge. One day, the nest was a hive of activity; the next, it was empty. 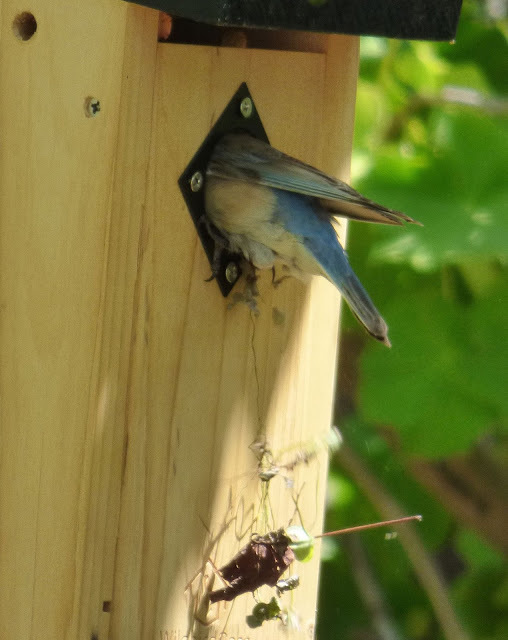 I caught one last glimpse of mama bluebird on her favorite perch overlooking the garden, and then they were gone. The garden seems strangely empty without them.